Kali Sulph (potassium sulphate) aids the transfer of oxygen and is important to our skin, mucus membranes and respiratory systems. Desquamation (PEELING) of cells of the epidermis and epithelium which have been loosened from their connection because they were not sufficiently provided with oxygen. It affects the access of oxygen and so facilitates the formation of new epithelium. Breathlessness attacks which is more troubling in the evening time. 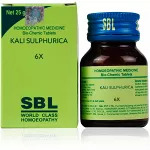 Kali sulph works wonders in later stages of inflammation. Yellow, mucous and serous discharges, profuse and intermittent high body tempertaure. Oxaluria (oxalate crystals in urine) kidney stones. Eruptions about the eyes and on the lids. Ring-worm of scalp or beard with abundant scales is an Indication of kali sulph. Constant scraping in the larynx, comes up after eating, at night in bed, until midnight; wants to clear the larynx and gets up only white thick mucus. 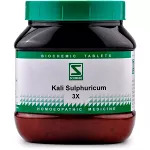 Falling Off Hair, Baldness, yellow dandruff is recovered with Kali Sulph. Diseased conditions of nail, skin swollen. Suffocative feeling in hot atmosphere, dryness in the nose. Bleeding in morning on blowing. Itching in the nose. 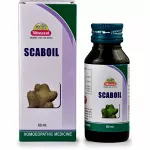 Eruptions on scalp, crusts, eczema moist, sticky, pimples, scaling. Fullness in head and hair falls out. 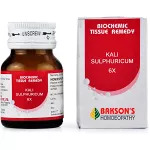 Psoriasis, warts over lips; Kali sulph is remedy of service. Ulcers, bleeding, burning, bloody discharge, stabbing, yellow discharge, indolent (laziness), pulsating, suppurating (pus with), tuberculous. 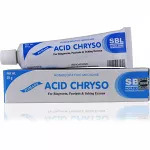 Painful warts is an indication of kali sulph, ulcers on legs. Arthritis complaints better by cold, pains from Joints to Joints, migratory pains. Arthritic nodositities with eruptions on legs, pimples and vesicles on limbs. 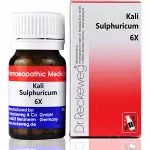 In Sexual Incompetence of men Kali sulph works well. Ill effects of chill when overheated, Injuries, suppressed eruptions. Adults and adolescents (12 years and older) 2 to 4 tablets, four times daily, or as recommended by your healthcare practitioner.